Enthusiasm and honesty are the vital ingredients in successfully luring potential candidates with job ads. This will explain the sometimes overblown lengths employers will go to describe even the most rudimentary of jobs. 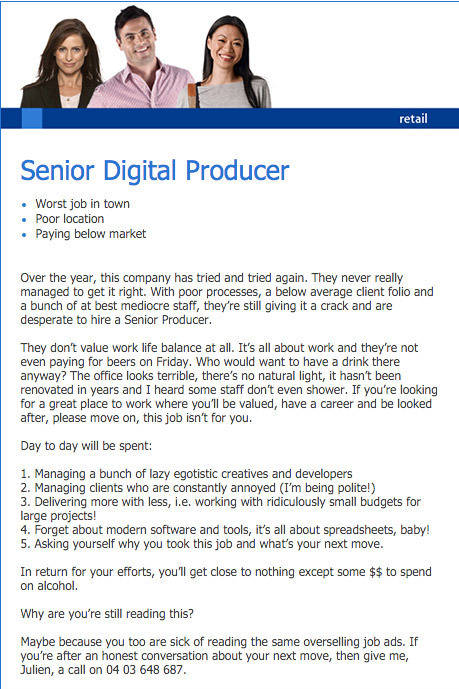 However, in this new job advert, recently surfacing on Mashable, from Australian job website, Seek, a recruitment ad for a Senior Digital Developer doesn’t shy away from painful honesty in terms of what the role entails. We’re not sure if it’s satire or possibly the most aggressive instance of reverse psychology in human history but the first bullet point of the description hails the role: “The worst job in town” so it’s anyone’s guess. Reading further down this enticing position sees that the company is in unabashed dire straits. The business has no regard or value for “work life balance”, and won’t even pay for the beers at the end of the week. The day to day activities revolve around “managing a bunch of lazy egotistic creatives” and “asking yourself why you took this job” in the first place. What’s discerning about this offer is that it’s a real position. A position some poor soul is probably going to have to take. However, there is a catch. The post was published by digital recruiter, Julien Viard. A man so worn out with jobs promising “the best money” and “the best coworkers” that it compelled him to challenge the status quo: to post the most realistically dreadful advert to which many people applied for out of pure novelty. So just remember to take adverts with a pinch of salt. On paper they may seem to be the dream job, but learn from this story and prepare yourself for the “egotistic coworkers” and “below average client folio” that come with any new position.